England's midfielder Raheem Sterling (centre) celebrates after scoring their third goal. England have stormed to the top of qualifying Group A ahead of Monday's trip to Montenegro, who drew 1-1 at Bulgaria. Jadon Sancho is one of the new additions to Gareth Southgate's squad since that revival for the Three Lions in Russia and was handed his first competitive international start. After a lacklustre start in which the hosts dominated possession without threatening much, one move of genuine quality opened the scoring on 23 minutes and the way to a comfortable night for Southgate's men. Gone are the days where they are contenders to win the Euros, but Jaroslav Silhavy's side did at least spark briefly into life after the break. 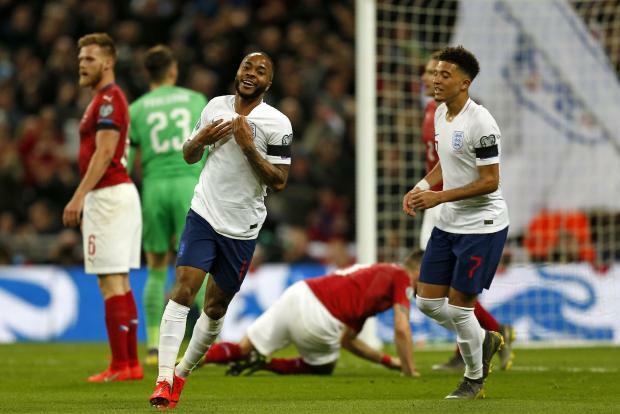 That was Sterling's final act as he made way for another precociously talented 18-year-old, Callum Hudson-Odoi, to make his international debut, while Declan Rice was also handed his England debut after switching allegiances from the Republic of Ireland. And Hudson-Odoi had a big part to play in England's fifth as his shot was parried by Pavlenka into the onrushing Kalas, who haplessly turned the ball into his own net.